It’s a staple of cult television: At some point not too long after the deeply beloved/critically supported/little-watched TV show gets canceled prematurely, a rumor of its revival in movie form is floated. 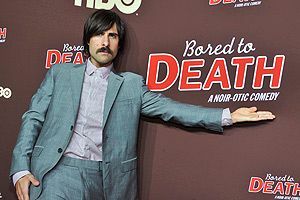 Certainly fitting the bill is Bored to Death, let go by HBO in December after three seasons of excellently panicky, emotionally vulnerable grown-up-Brooklyn-set detective work by Jason Schwartzman, Ted Danson, and Zach Galifianakis. And on cue, here comes its movie rumor. As Vulture first noted, a French journalist, Pierre Langlais, spoke with Danson at the Monte Carlo Television Festival and was told by Ted that there was a good chance a 90-minute BTD movie would happen. (Langlais’s exact words: “Ted Danson annonce un fort probable 90mn Bored to Death pour HBO ! ‪#FTV2012‬” Magnifique!) HBO then told Vulture that while there have “been some conversations,” any potential movie is “at a very early stage.” But it’s at a stage, though, which is certainly further along than it was, say, last week, when, based on all then-available evidence, which was no evidence, we all would have been forced to agree that a Bored to Death movie straight up didn’t exist, at any stage. Generally, this would be the point where one would advise caution, as the canceled-TV-show-to-movie success rate is of course pitifully low. Furthermore, as THR points out, it’s not really HBO’s thing: “This is not the first time a defunct HBO series has been candidate for the TV movie treatment. There were talks for fixed continuations of Carnivale and Deadwood — and as recently as 2011, there had been discussions of bringing The No. 1 Ladies’ Detective Agency back as a series of films. Despite various levels of interest, none of those projects has come to fruition.” But we are now living in a world where the Arrested Development movie — the Arrested Development movie!!! — is a real thing, meaning all heretofore held assumptions can go out the window. So dare to dream, Bored to Death fans. Dare to believe. By the way, HBO, when you’re done with the BTD movie, could you move on to a How to Make It in America feature film next? You’d be making roughly two-thirds of the Grantland staff very, very happy.